The Java Fern, scientifically known as Microsorum pteropus is a classic and very popular aquarium plant. This delicate looking fern adds a beautiful look to aquariums. It’s widely used due to its slow growth, unique shape and ease of reproduction and care. It can be kept with a wide range of fish and doesn’t require strict water parameters, which is why it is so appealing to so many people. They are one of the easiest plants to grow for beginners. In this article we’ll cover the origin and appearance of the plant, how to plant and maintain it, propagation methods and suitable tank mates. Before you read on, you can take a look at this quick summary. 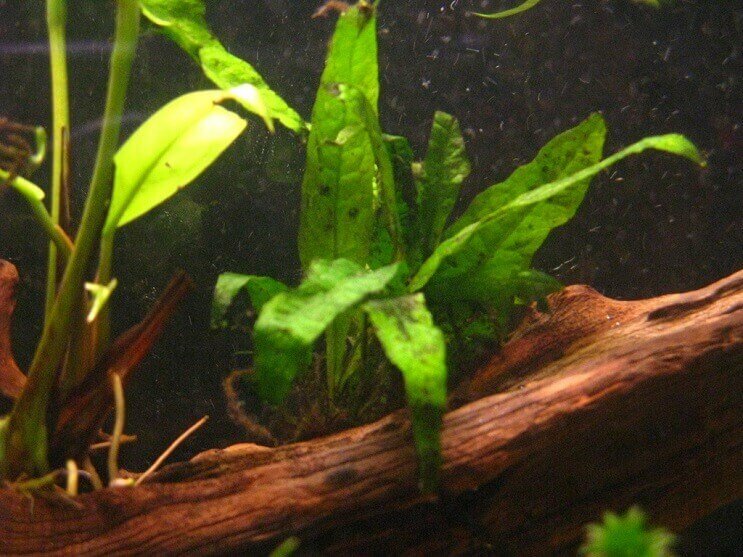 Is Java Fern Suitable for Your Aquarium (Summary)? Java Fern is a member of the Polypodiaceae family which has more than 60 different genera. Microsorum is a genus within this family, which includes over 50 species of tropical ferns. Perhaps one of the most popular species within the Microsorum genus is Microsorum pteropus, otherwise known as Java Fern. It originated from South East Asia and is a jungle plant which typically grows on rocks, the ground and around tree trucks along the waterline of steams and waterfalls. It also grows in tropical rain forests, like grass. It can grow whilst both fully submerged or partially submerged. Java Fern has been in the hobby for a long time, and over the years new varieties have been developed. The most popular ones you’ll find in fish stores are narrow leaf, needle leaf, trident and windelov. It’s relatively cheap; you can buy a small plant for around $4-5. Sometimes they come already attached to driftwood, making it really easy to pop straight into your tank. Plants that are already growing on wood tend to cost more, depending on the size you can expect to pay upwards of $20. When you buy them they will typically be around 3-5 inches in length. Make sure you choose a healthy plant, with no brown edging and green healthy looking leaves. Avoid buying a bunch, sometimes shops just bunch together a load of leaf cuttings and they are missing the rhizomes. This is a great plant if you’re on a budget. It is almost impossible to kill this plant unless you are doing something to actively try! 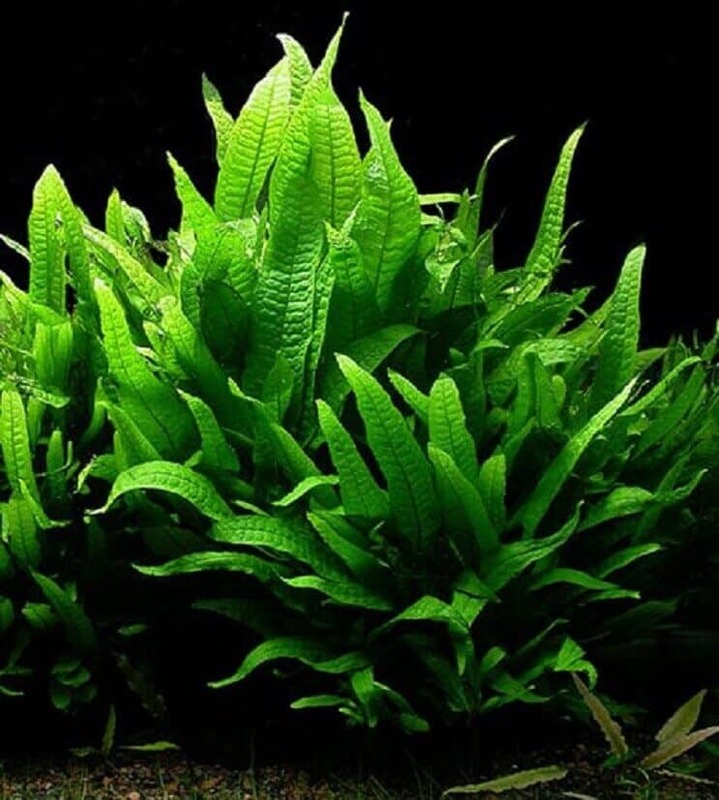 Java Fern is a traditional green aquarium plant, and is made up of two main components; rhizome and leaves. The rhizomes act as an anchor, and are dark brown hair-like strings that attach themselves to many different surfaces. The leaves are very hardy and have a leathery texture in a range of unique shapes, from bushy to spiky. It comes in a variety of greens, from medium to dark green. Typically, the higher the lighting, the darker the green. Some mature leaves develop a few black/brown tiny circular bumps (one method of propagation which we’ll discuss shortly), and occasionally have a few black veiny lines going through the leaves. The plant can reach heights of about 13.5 inches, and can reach 6-8 inches in width. This makes it perfect for a wide variety of tanks, from large community tanks to heavily planted tanks or even a show tank. The original plant has variants which impact the size and leaf shape. We’ll take a look at some of the most popular aquarium varieties; however there are other less known varieties available too. Narrow Leaf Java Fern: This plant has narrow leaves, which grow at a steeper angle than the regular Microsorum pteropus. Leaves grow to around 4-8 inches and the plant can grow as high as 12 inches. Needle Leaf Java Fern: This plant has even thinner leaves, and is smaller than the narrow leaf plant. It can grow to heights of 6 inches. True needle leaf Java is fairly rare in the trade. Trident Java Fern: This is one of the more uncommon variants, it has feathery lobed leaves with 2-5 lobes on each side of its leaves. It is shorter than the narrow leaf, but grows quicker, and has more forks in each leave. Windelov Java Fern: A unique variant with finely branched leaf tips. It usually grows to around 8 inches tall. Like fish, aquatic plants thrive when the tank conditions match their natural conditions as closely as possible. In its natural climate, Java Fern grows alongside streams and is often found near moving water. Filters and powerheads provide enough oxygen for these plants within the aquarium – they do not need lots of extra CO2. They are also found on jungle floors, where soft acidic water is sprayed on its leaves from streams and waterfalls. To replicate these conditions, the recommended pH is between 6.0 and 7.0 with a hardness of 3-8dGH. It’s is an extremely hardy plant and really doesn’t need any special conditions to help it grow. It doesn’t require high light, good substrate or high nutrients, which is why it’s such a dream plant. You don’t need a fancy tank for it to grow; it will grow in the most simple of setups. Size wise, it can be grown in tanks as small as 10 gallons. We don’t recommend you put it in tanks smaller than this. It will grow in most lighting conditions; the most preferable are subdued florescent or incandescent bulbs. Do not make the lighting too strong – they will become brown and transparent if the lighting is too strong. If this happens, reduce the lighting or turn it off for a few days until the plant recovers. In the wild, these plants actually grow in the shade and don’t have exposure to strong light. Ideally, it needs 1.5/2 watts of light for each gallon in your tank, using 5000-7000K bulbs. Temperature wise, the plant will grow in cold water and tropical tanks, its preferred temperature is between 68-82oF. It is also ideal for bare bottom tanks as it doesn’t require any substrate. If you do want to include substrate in your tank with the plant, choose anything you like; this plant doesn’t draw nutrients from the substrate. Interestingly, some people insist that this plant can survive in brackish waters, and whilst it will live for a while, it most likely will not grow and will eventually die. Java Fern has rhizomes which do not like to be buried. The plant will grow extremely slowly, or may not even grow at all if you bury them. Instead of burying it, you’ll need to attach it to driftwood, rocks or something similar. Rough surfaces make better surfaces than smoother ones. Anything like lava rock or driftwood will work perfectly. If the surface of an object is too smooth (e.g. pebbles or glass), it will take longer to attach however it usually does still attach eventually. A large piece of driftwood is preferable to give it plenty of space to spread, however small pieces are also fine to use. To secure the plant, tie the roots using fishing wire to your chosen object. Black is the preferable color of thread to use as it matches the color of the roots. Some people prefer to use rubber bands or zip ties, however they will usually be visible from the exterior of your tank. You’ll find that after a few weeks, the roots will have attached themselves to the surface of whatever you’ve attached them to. Once the roots are secured you can remove them the ties; you might want to do this if you’ve chosen a tie which is really visible. You don’t have to remove fishing line etc. if you don’t want to as the plant will cover it up as it grows. Java Fern can grow quite large and has particularly wide leaves; it’s therefore recommended that you plant it in the middle, or towards the back of the tank, unless you’re trying to achieve a jungle look. If you place it at the front of the tank it will hide everything else that you have in there. You can either plant your it alone, in groups, or other plants. You might also want to float this plant instead, however its rhizomes will keep growing longer and longer until it finds something to attach to. Java Fern is one of the easiest plants to care for; if you’ve ever struggled with growing aquarium plants, give this one a go. You might find that it takes a while for your plant to start growing, it may just be adjusting to your tank conditions and establishing its rhizomes. Once this has happened, it will start growing. How you care for your it depends on the type of look you want to achieve in your tank. If you want to keep your plants small and separate, you will need to remove the small new plantlets that develop on the leaves as they appear (we’ll cover how to do this in the propagation section). If you want to create a really bushy type growth, just leave the plant to keep growing. As new plantlets develop, instead of removing these to create new plants, leave them to grow to achieve a large dense effect. These plants take nutrients in from the water through their leaves, so don’t require a fertilizer. However if you want to use fertilizer to encourage quicker growth, you can do so.Having no true roots, they get most of their nutrients through their leaves from the water column, so substrate fertilizers will be useless. Instead, add a liquid fertilizer each time you perform a water change. If your plant has developed burn spots, you can prune the plant to remove them. Due to its slow growth, you may find that you only need to do one big prune a year. Cut the leaves as closely as you can to the rhizome. The beauty of Java Fern attaching itself to rocks and driftwood is that when it comes to cleaning your tank you can move it whilst you clean. This is particularly appealing to tanks containing messy fish. N.B. When you are cleaning your tank, or doing any other maintenance, this plant needs to be kept wet at all times so either keep it submerged or use a spray bottle to keep the leaves moist. Many newcomers think that all plants need to be planted in the substrate. This is a common mistake and will lead to Java Fern dying. You’ll find it will survive for a few weeks buried in substrate but then it will start turning brown which is a sign it is dying. A second problem that people experience is that they find the plant isn’t growing. It’s normal to experience no growth for the first few weeks. If it still isn’t growing then you can consider using fertilizers as mentioned above. Another common mistake people make with this plant, is mistaking the black/brown spots on the leaves for an unhealthy plant. These black circles are where the new plantlets will sprout from, so don’t worry! Black spots that aren’t developing into new plants could be a sign of nitrogen deficiency; other spots may indicate burns so turn your lights down. The last problem we’ll look at is Java Fern melt. This is characterized by large brown spots, which in turn cause the plant to rot and turn mushy. 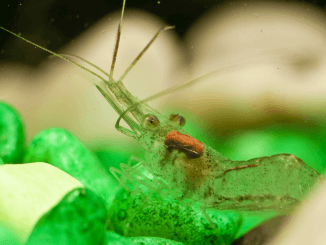 This normally happens either because the plants don’t have enough nutrients, there is too much light, or if there is too much blue-green algae in your tank. As a side note, if you do have a little bit of algae, you might want to consider getting a clean-up crew to help keep on top of it. None of these should be a problem if you set your tank up correctly, follow the planting and maintenance section correctly above, and perform regular water changes. Propagating Java Fern is very easy and doesn’t require any special conditions or work on your part. Firstly, you could cut the rhizome in half and replant the cut sections. The separate plants will then continue to grow. Alternatively, you can wait for the plant to develop tiny Java Ferns on its leaves. These sometimes start off as black spots on the underside of the leave. Over around 2-3 weeks, tiny leaves start to sprout out from the black bumps. They can easily be cut off, using sharp and sterilized scissors, and moved elsewhere in the plant to start new growth. As the plantlets develop and mature they will start the growth process all over again. Remember the new plant will still need to be tied down in the same way we discussed earlier. This plant is very compatible with a huge variety of fish. 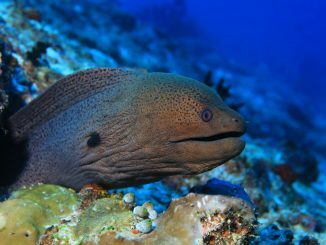 Even fish which are herbivores, and usually eat aquarium plants, tend to stay away from this one. It also has a very tough leaf structure, making it unappealing for fish to eat. 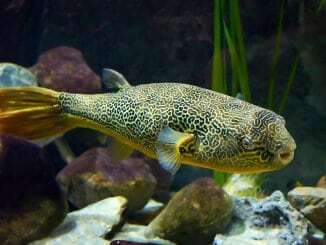 It is compatible with both nippy small fish and large fish such as Cichlids, Tiger Oscars, Catfish, Arowanas and other large fish that normally damage more sensitive plants. However just do so with caution at the beginning of the plants life cycle. Its roots won’t be that strong yet; hence it will be susceptible to being damaged and knocked over if you choose to house it with large, more aggressive fish. If you do house it with larger fish, attach the plant to driftwood or rocks to prevent the roots from being damaged. 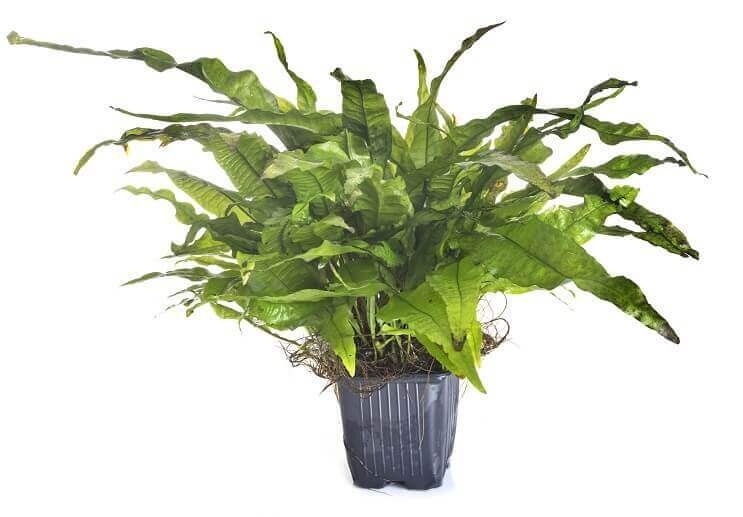 The Java Fern is a very hardy, strong and firm plant which is difficult to be torn apart. If you want the plant to look smooth and beautiful, you should avoid housing it with nippy or plant shredding fish. If you have a freshwater aquarium, then it’s almost 100% likely that this plant will be suited to it. 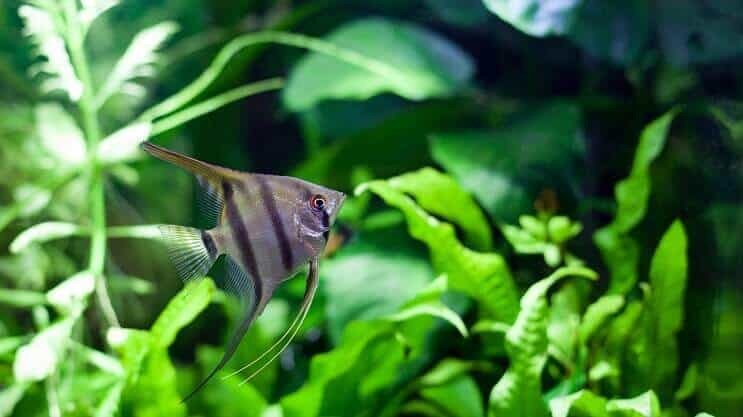 Whether you are new to the hobby or an experienced veteran, this plant has lots of great qualities that make it a desirable aquarium plant. It’s extremely easy to care for and maintain. It’s easy to propagate and a wide range of fish can be kept with it. There are a few different variants available; the type you choose will depend on availability and personal preference. I frequently come on this site just to read through articles for the great advice and interesting information. Even species and plants I don’t keep are great to read up to and the articles dispense with all the padding I find on other sites that makes it difficult to find what I need to. You have quickly become my go to fish bible for concise, easy to absorb information on how to choose, keep and breed various species who with your help are all doing great things. Thank you for a great job done well. i enjoyed the articlle well written. I have some experience with Java Fern but need help. The plant grew well for about 6 months the plant grew to a nice size then one day i noticed some black spots than the leaves started to come apart. they looked like a house being built. all frame work with nothing inside. just like only the leaf veins left. can it be not enough fertilizer? The plant is in a 55 gallon tank i have an led light on it . I covered the light directly over it to reduce the light. nothing seems to help the rhyzome ie still green but not much else is left. I purchased another plant but it seems to be starting with the leaves turning black. The fish in the tank are guppies and they appear healthy.